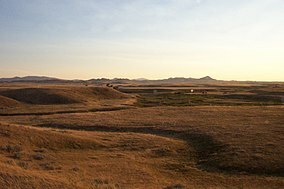 The Nez Perce National Historical Park is a United States National Historical Park comprising 38 sites located throughout the states of Idaho, Montana, Oregon, and Washington, which included traditional aboriginal lands of the Nez Perce people. The sites are strongly associated with the resistance of Chief Joseph and his band, who in June 1877 took off from Oregon in an attempt to reach freedom in Canada and avoid being forced on to a reservation. They were pursued by U.S. Army cavalry forces and fought numerous skirmishes against them. The park was established in 1965, and a museum was opened at the park headquarters in Spalding, Idaho, in 1983. The 38 sites span three main ecoregions, covering a wide range of elevations and climate. Numerous animal species inhabit the park, including several that are considered sensitive. The park commemorates the history, culture, and stories of the Nez Perce. It includes sites associated with the Nez Perce War of 1877, when the people resisted takeover by the United States, and the flight of Chief Joseph and his band. The park is administered overall by the National Park Service, and a number of the sites are managed by other federal and state agencies as well as local communities; the park's headquarters are located in Spalding, Idaho, east of Lewiston. The park was established by Congress in 1965. Construction of the planned headquarters site and museum at Spalding were delayed by land acquisition and federal funding problems. Soon after construction began in September 1979, Native American graves were discovered at the site. Remains and artifacts were preserved in consultation with the Nez Perce. Construction of the visitor center and museum was later restarted. The museum opened in June 1983. The Nez Perce National Historic Park does not follow the format of most national parks, in that it is composed of dozens of sites spread over four states. The 38 sites are linked by the history of the Nez Perce people, rather than by geographic location. Twenty-six of the sites are on or near the Nez Perce Indian Reservation in Idaho and can be toured in one day. 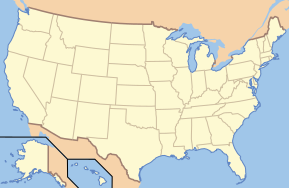 Adjacent states hold the other twelve sites. Several of the sites are connected by the Nez Perce National Historic Trail, managed by the United States Forest Service. It preserves the route taken by Chief Joseph and his band when they tried to reach Canada in 1877. The NPNHP sites cover three main ecoregions. The first, found at the sites in the Palouse grasslands and Missouri Basin, is shortgrass prairie. These flat or slightly rolling prairies include rivers and streams, and have an altitude of about 1,000 to 3,500 feet (300 to 1,070 m). The second, found in the plateaus of the Columbia and Snake rivers, is sagebrush steppe at around 3,000 ft in altitude; it includes lava fields and flows. 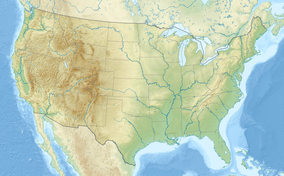 The third, found in the sites in the Blue Mountains, Salmon River Mountains, southwestern Montana and northern Rocky Mountains, is conifer and alpine meadows. These high-elevation sites have lower temperatures and greater precipitation than the other ecoregions. Numerous species of mammals, amphibians, reptiles, birds and invertebrates inhabit the various park sites. Several of these species are classified in terms of their status as "threatened," "endangered" or "sensitive" at the state level. Montana Arctic grayling, mountain plover, swift fox, great grey owl, boreal owl and several fish species are all sensitive species that inhabit the park, while gray wolf and bald eagles are sometimes seen. Managers of the park have several ecological concerns including issues of invasive plant species, the degradation of animal habitat due to human activity, the protection of endangered species, and dealing with effects of climate change. ^ "NPS Annual Recreation Visits Report". National Park Service. Retrieved 2017-04-25. ^ Hewlett, Frank (May 6, 1965). "Nez Perce historical park assured by Senate action". Spokemsan-Review. p. 12. ^ "Senate quickly agrees on park bill changes". Lewiston Morning Tribune. (Idaho). May 6, 1965. p. 16. ^ "Park acquires almost all land needed for headquarter site". Lewiston Morning Tribune. (Idaho). March 14, 1968. p. 16. ^ Cameron, Mindy (May 17, 1970). "Nez Perce Park designation expected any day". Lewiston Morning Tribune. (Idaho). p. 11. ^ "Federal economy ax falls on park visitor center". Lewiston Morning Tribune. (Idaho). February 22, 1973. p. 20. ^ "Indian graves delay construction". Lewiston Morning Tribune. (Idaho). September 16, 1979. p. 2B. ^ Lee, Sandra L. (March 30, 1983). "Nez Perce Park's visitor center to open about June 15". Lewiston Morning Tribune. (Idaho). p. 1C. ^ "New visitor center opens at Spalding". Lewiston Morning Tribune. (Idaho). June 29, 1983. p. 14E. ^ a b "Nez Perce National Historic Park Sites". National Park Service. Retrieved 2013-12-05. ^ Pia Hallenberg Christensen (September 14, 2008). "Nez Perce museum in Spalding, Idaho, a hub for tribe's history". Seattle Times. ^ "Nature & Science". National Park Service. Retrieved 2013-12-05. ^ "Animals". National Park Service. Retrieved 2013-12-05. ^ "Environmental Factors". National Park Service. Retrieved 2013-12-05. "Master Plan Nez Perce National Historic Park". National Park Service. 1968. Retrieved 2012-12-10. Ted Catton (1996). "Administrative History-Nez Perce National Historic Park". National Park Service. Retrieved 2012-12-10. John Dishon McDermott (1968). "Forlorn Hope-A Study of the Battle of White Bird Canyon Idaho and the Beginning of the Nez Perce Indian War". National Park Service. Retrieved 2012-12-10. Robert Applegate (2005). "Museum Management Plan-Nez Perce National Historical Park" (PDF). National Park Service. Retrieved 2012-12-10. This page was last edited on 15 November 2018, at 17:56 (UTC).